This series of the Isaac Tichenor Goodnow collection includes sent and received correspondence of Isaac T. Goodnow (1814-1894) and also the correspondence of his brother, William E. Goodnow (1807-1876). This correspondence includes early courtship letters between Isaac and his future wife, Ellen Denison, as well as letters between William and his future wife, Harriet Paddleford. 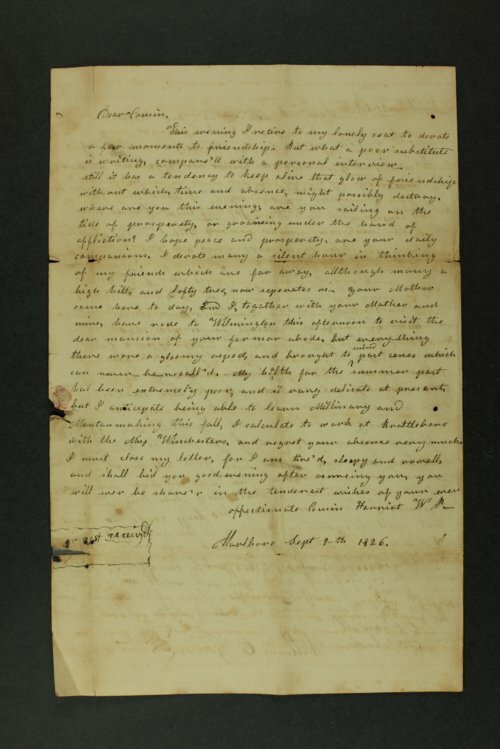 There are also several letters written by their brother, Jotham Goodnow. The correspondence is arranged in chronological order. Box 6 includes undated letters arranged by the first letter of the correspondent's last name. Isaac Goodnow moved to Kansas in 1855 and established the town of Manhattan and Bluemont Central Colllege. He died on March 20, 1894.